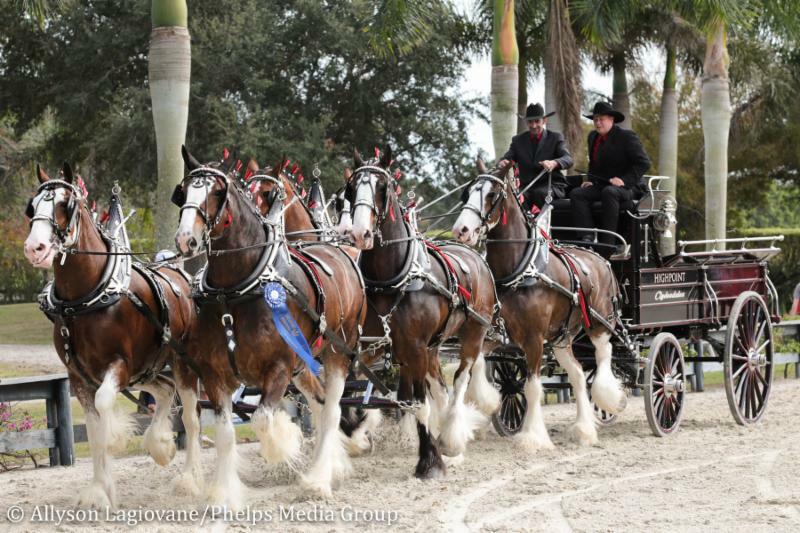 Wellington, Fla. – Feb. 8, 2019 – The first day of the Chesapeake International Draft Horse Show in the equestrian community of Wellington, Florida took place Friday, February 8. Founded by Victoria McCullough, the Chesapeake International Draft Horse show was held at Crab Orchard Equestrian Estate, generously donated by Frank and Monica McCourt. Beautiful wagons painted in team colors showcased the heritage of the sport and made up the whole package as these teams displayed their skills to the judges. Showcasing the three breeds of draft horse, Belgian, Clydesdale, and Percheron, classes Friday featured a six-horse hitch for each breed as well as a ladies cart. For each class, spectators watched in amazement as the gentle giants entered the arena. The judges lined up in the middle of the ring to watch the team tests which consisted of teams‘ completing three laps around the ring at the trot before changing direction across the diagonal. Trotting across the diagonal gives the drivers a chance to showcase their team’s skills to the judging panel. All hitches were then asked to demonstrate the natural gait, the walk, and the trot in the opposite direction to show the horses ability to work in unison under control. After being asked to line up in the center of the ring, the judges took a final look at the hitches‘ presentations, while also asking for a demonstration the reverse gait. The final team scores were based on their ability to work together, head carriage, consistency, and the overall presentation of the hitch and driver.